On a comfortable length of thread (no longer than 5') and leaving a 3" tail, string a stop bead. Pick up 1 B, 9 A, and 3 B. Skip the last B added and pass needle and thread through the next B. Pick up 1 B, 9 A, and 1 B. Pick up 9 A and 3 B. Skip the last B added and pass through the next B. Pick up 1 B. Continue in this manner until you have 6 picots made. End by stringing 1 B and 9 A. Pass needle and thread through the first B strung and the next 6 A. To make the seventh picot and start working the netting to gather the base together, pick up 3 A and 3 B. Skip the last B and pass through the next B. String 1 B and 3 A. Pass needle and thread down through the six beads nearest the next center B bead. Pass through the center B bead and pull snugly. Pick up 1 B and pass through the next B bead in the ring. Pass needle and thread up through the next 6 A beads before the next picot. Continue to work as outlined in Steps 6 - 8 to gather the petals together. Remember to add a B bead into the base before stitching the following petal. 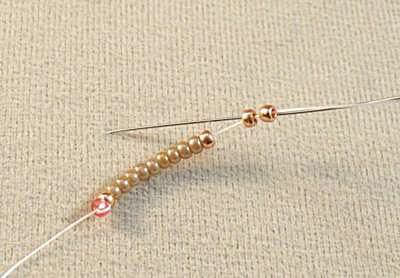 Weave needle and thread through the base so that you are exiting one of the center B beads. Pick up 6 C and 3 B. Skip the last B and pass needle and thread through the next B. Pick up 1 B and 6 C. Skip the next B bead in the center of the flower and pass needle and thread through the next center B bead. Continue adding petals of the second layer using C and B beads until you have a total of 6 new petals. After adding the last petal, weave needle and thread so that you are exiting from the third C bead of the first petal made. To gather the second layer of petals together, pick up 3 B. Skip the last B and pass needle and thread through the next B. Pick up 1 B. Pass needle and thread down through the bottom 3 C beads of the next petal. After you have added a total of 6 picots in between the 6 petals of the second layer, weave thread into the beadwork, knot and add a drop of glue if desired, weave the thread into the beadwork a little more and trim close to the beadwork. Weave in the tail that is coming out of the center circle of B beads as well. These flowers make wonderful brooches and pins. You can work them up in a variety of colors using a variety of seed beads - try using triangle beads instead of hex-cut beads for the second layer of embellishment. Use one as the centerpiece for a fabulous corsage-like bracelet. Dangle three or four from a netted necklace. Make a statement pendant by combining three or four peyote-stitched Russian style leaves in a cluster underneath a flower and hang from a beaded or satin rope. Work two in size 15 beads and make a stunning pair of earrings. Stitch a Swarovski crystal or gemstone bead as an accent into the center ring.